Welcome to the BBC Website! ​Our website is loaded with present and past information about the Brooks Bird Club, birds & nature, and birding in West Virginia! ​Please use the dropdown tabs above for event information, photos, books, checklists, chapters, affiliates and so much more! What is the Brooks Bird Club? It’s an independent, educational, nonprofit organization that promotes the study and enjoyment of birds and other elements of the natural world. Many club members undertake studies that have lasting scientific value, e.g., population and breeding bird surveys, bird banding, and Christmas Bird Counts. Every June the Brooks Bird Club has an event called the "Foray". ​Here members from the club's chapters and affiliates can come together to find all the fauna and flora possible, while enjoying nature related programs, campfires and friendship. ​Most of all we are a bird club... Our members go out throughout the year enjoying and exploring nature while finding and identifying all the birds we can! The club symbol is the American Redstart. The male Redstart is a black and orange wood warbler. American Redstarts migrate from South America to nest in West Virginia and other surrounding states. The male sings a beautiful high pitched variable song. To find a pre-scheduled BBC nature related outing, check out our Calendar of Events page. ​You can link our calendar to your computer, tablet or phone. The 2019 1st quarter Mail Bag (the BBC newsletter) is now available! ​You can read The Redstart (our scientific journal) online as well! ​Jan. ~ Issue 1 is now on the website. We now have all 85 years (1933 - 2018) of The Redstart available on our website for reading, reference and research. ​Fall and winter is a great time to put out suet for birds such as woodpeckers, wrens, chickadees, nuthatches, and titmice. Find out how to make your own suet on our Feed the Birds Page! Create your own Wildlife Sanctuary! Did you know the BBC has a Wildlife Sanctuary program? ​Learn how to have your own personal Wildlife Sanctuary! WV conservation begins with you. ​ You can make a difference... Please help where you can! The Brooks Bird Club is always looking for new birders. ​Are you new to birding? Do you enjoy the outdoors and nature? Have you been watching and enjoying birds for years? ​Come join us, we cater to all nature enthusiasts! ​John James Audubon's Birds of America is a portal into the natural world. Printed between 1827 and 1838. Nearly 200 years later, the Audubon prints are coming to life once again, thanks to a vibrant digital library. Get your Audubon Prints. Each print is available as a free high-resolution download. Finding a feather always sparks interest. What bird was it from? ​Learn about feather forensics, check out the Feather Atlas! The 2018 Allegheny Front data is posted. ​To see photos and the seasonal data from the Valley Falls State Park banding station, click on the NSWO link above. The 2018 Valley Falls data is posted. ​The MAPS program is a continent-wide collaborative effort to assist the conservation of birds and their habitats through demographic monitoring. Since 1989, more than 1,200 MAPS stations were started across North America. We currently have 3 stations in West Virginia. Click the MAPS link above to learn more about this bird banding program. What are Alpha Codes? It's the 4 or 6 letter code for all birds. ​Alpha Codes by common name or taxonomic order. To see past events that our BBC members enjoyed, click below! The 58th WV Wildflower Pilgrimage will be May 9th-12th. Learn all about this wonderful event here! The 2019 BBC Foray will be from June 7th ~ 15th. The Foray will be held this year in Randolph County WV. Not sure what the BBC Foray is all about? Learn about the BBC Foray here. Learn about this years 2019 BBC Foray. Sign up for the 2019 Foray on our BBC Foray Application Page. BBC Scholarships are available to members. Online application forms are now OPEN! Many migrating birds are now being reported in the state. Wood warblers and other Neotropical Migrants are beginning to fill our woodlands! Time to get out and enjoy the spring migration! The colonial nesting Great Blue Herons are laying eggs. Look for a rookery near you! ​The spring wildflowers are beginning to peak! ​Listen and watch for American Woodcocks the male woodcock has a fascinating aerial mating display, a spring must see! ​Great Horned Owls have young on the nest! Spring is here, brush up on those wood warblers! Download the Merlin app from the Cornell Lab of Ornithology, it's free! Have you renewed your BBC membership yet? ​Join or renew your BBC Membership here on the website! *Our Redstart Editor Casey Rucker is always looking for interesting observations. It's always a great time to get out and observe nature. Write a nature related article for The Redstart. Here's a great year-round project from the Cornell Lab of Ornithology. ​Learn how to make perfect nest boxes & structures. Just pick the bird species you're interested in and the Cornell Lab will give you the building plans. The information includes how and where to place the bird box/structure to be successful! WV Christmas Bird Count Results: Want to know what birds were seen and how many birds were found last season in WV? Check out our WV CBC Results Page! West Virginia eBird: Explore current WV eBird data. Mountain Nature Camp will be held June 16th - 22nd. Located in Terra Alta West Virginia in Preston County, MNC is Oglebay Institutes nature camp for adults. MNC will be celebrating its 90th anniversary this year! There will be a special celebration on Saturday June 22nd! Learn how to sign up for the 2019 Mountain Nature Camp and how to register for the 90th anniversary celebration here! ​WV Nature Conservancy: Learn about the Nature Conservancy's West Virginia Protected Preserves and Landscapes. WV Natural Area: The Forks of Coal Natural Area. ​The Canaan Valley NWR has programs and outings year round! WV Hiking: Many WV State Parks have organized hiking events. ​Get out and enjoy all that our parks have to offer! ​Looking for new places to bird in WV? Check the WVDNR list. ​You can also buy our Birding Guide to WV here on our website! Are you a new birder? Do you want to learn more about birding? We have a new page dedicated to you, it was suggested by a young student who found it while working on a bird migration project. The page is loaded with information for new birders of all ages! Here it is Birding for Beginner's thanks to Hayley! ​Rare birds are found in West Virginia every year. ​If you see a bird that you believe is not normally seen in WV, take photos if possible, make notes on what you see and hear, call other friends/birders, and let others know quickly. ​Then report it to the WV Bird Records Committee. ​Rare birds are defined as birds never or rarely seen in the state. Keep updated of rare birds being reported in WV, learn what birds are on the WV State List, and on the WV Review List here! ​The list of submitted rare bird reports that the WV Bird Records Committee received and voted on in 2018 . ​To see past reports submitted, go to the WVBRC Archives Page. Some of the rare birds seen in WV! ​check out The Birding Wire. Are you planning a bird or nature related outing? Let us know and we will post it on our Calendar of Events or Home Page. Support bird habitat conservation! The U.S. Fish & Wildlife Service offers Duck Stamps for purchase. 98% of the price goes towards the National Wildlife Refuge Service. 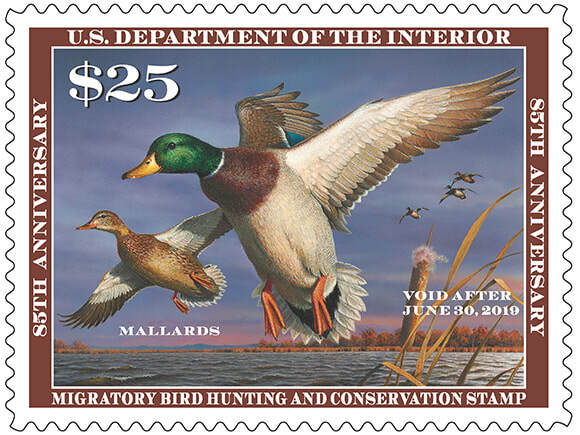 The new 2018-2019 Mallards stamp is available now! ​Read more about them & buy yours here. Winter: Check out the rivers, lakes and ponds. Look for waterfowl and gulls. Help on a Christmas Bird Count. Spring: Look for returning swallows, warblers, flycatchers, orioles and other birds migrating north. Summer: Breeding birds are everywhere, look for nests and fledglings. Shorebirds begin migrating south. Fall: The southward migration; look for shorebirds, songbirds and hawks. Visit a banding station and a hawk watch. Find a BBC chapter or a BBC affiliate in your area!